The Western Bay Health and Social Care Programme is leading the way in Wales by launching the first DisabledGo accessibility guide in the country. Thanks to the Programme’s support, disabled residents and visitors across Swansea, Bridgend and Neath Port Talbot have their own access guide, which provides detailed accessibility information to around 350 venues. The guide covers a wide range of venues, including leisure centres, libraries, restaurants, community centres, council buildings and shops which have been visited and assessed by a DisabledGo surveyor or a local surveyor from Every Link Counts, who have looked at a whole range of accessibility features from hearing loops and parking to accessible toilets. The Western Bay venues will join 125,000 other locations across the UK that already feature on DisabledGo. DisabledGo already produce guides to many other towns and cities all over the UK. Founded by Dr. Gregory Burke,it’s an established and trusted service, which provides people with the specific information needed to make informed choices about access in their community and across the UK. To ensure the project met the needs of local people, the Bridgend Association of Voluntary Organisations (BAVO) was appointed by the Western Bay Programme to work in partnership with DisabledGo. They provided invaluable help with key elements such as ensuring priority venues were included in the guide and identifying which key disability and voluntary organisations needed to be consulted. BAVO’s Chief Executive Heidi Bennett, said “I am delighted to see this programme of work come to fruition. We all must consider the access needs of disabled people, they have a right to experience the same services and social activities that everyone else takes for granted, and very often that’s not the case. This resource is a step in the right direction”. 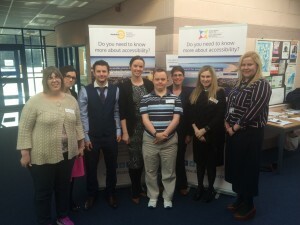 A launch event to celebrate the access information being available was held in February at Every Link Counts Headquarters in Maesteg.